To explore spaces that are difficult for human beings to access, such as thin, high branches and bushes, we are developing soft robots that imitate caterpillars. However, the crawling gait of the biological caterpillars has not been well understood. We challenge this problem constructively with numerical simulation. 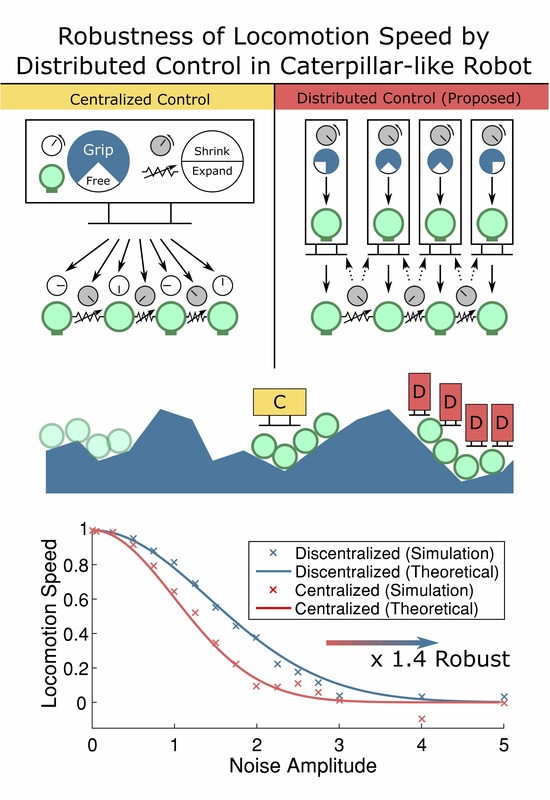 We propose autonomous decentralized control mechanism that moves the legs based on changes in the lengths of the preceding and succeeding body segments. Compared to the conventional models whose legs are sequentially moved at constant temporal period, our proposal succeeds in improving robustness by 1.4 times.